A priorities matrix evaluates and prioritizes a list of options. The team first establishes a list of weighted criteria and then evaluates each option against those criteria. This is a variation of the L-shaped matrix. When a list of options must be narrowed to one or a couple of choices. When the decision must be made on the basis of several criteria. 1. Brainstorm the evaluation criteria appropriate to the situation. If possible, involve customers in this process. 2. Discuss and refine the list of criteria. From the list, identify any criteria that must be included and then any that should not be included. Reduce the list of criteria to those that the team believes are most important. Tools such as multivoting may be useful here. 3. Based on the criteria importance to the priorities matrix, assign a relative weight to each criterion. Do this by distributing 10 points among the criteria. Assign the points by discussion and consensus. Another possibility; have each member assign weights, then totaled the numbers for each criterion. 4. Draw an L-shaped priorities matrix. Write the criteria and their weights as labels along one edge and the list of options along the other edge. Usually, whichever group has fewer items occupies the vertical edge. Method 1: Establish a rating scale for each criterion. Make sure that your rating scales are consistent. Word your criteria and set the scales so that the high end of the scale (9 or 1) is always the rating that would tend to make you select that option. The scale should reflect impact on customers, greatest importance, least difficulty, and greatest likelihood of success. Method 2: This may be the best method for an indiviual ranking when there is no group. For each item on the list of the priorities matriax, rank-order all critreia on how well that critieria meets the each item. Method 3: Establish a baseline, which may be one of the alternatives or the current product or service then rank all the others. For each criterion in the priorities matrix, rate each other alternative in comparison to the baseline, using scores of worse (-1), same (0), or better (+1). Finer rating scales can be used, such as 2, 1, 0, –1, –2 for a five-point scale or 3, 2, 1, 0, -1, -2, -3 for a seven-point scale. Be sure that positive numbers reflect desirable ratings. 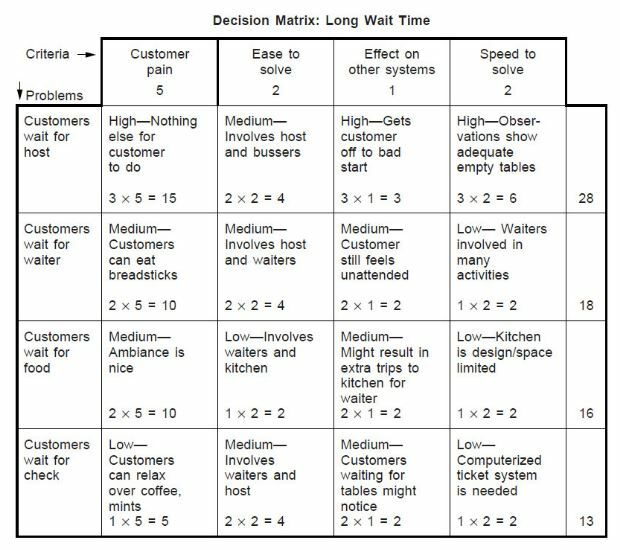 Figure below shows a priorities matrix used by a customer service team at a restaurant to decide which aspect of the overall problem of "long wait time" to tackle first. The problems they identified are customers waiting for the host, the waiter, the food, and the check. The scaling criteria they identified are "Customer pain" (how much does this negatively affect the customer? ), "Ease to solve", "Effect on other systems", and "Speed to solve". Originally, the criteria "Ease to solve" was written as "Difficulty to solve", but that wording reversed the rating scale. With the current wording, a high rating on each criterion defines a state that would encourage selecting the problem: Preferably we want to focus on issues that are high customer pain, very easy to solve, high effect on other systems, and quick solution. "Customer pain" has been weighted with 5 points, showing that the team considers it by far the most important criterion, compared to 1 or 2 points for the others. Each rating is multiplied by the weight for that criterion. For example, "Customer pain" (weight of 5) for "Customers wait for host" rates high (3) for a score of 15. The scores are added across the rows to obtain a total for each problem. "Customers wait for host" has the highest score at 28. Since the next highest score is 18, the host problem probably should be addressed first. A very long list of options in a priorities matrix can first be shortened with a tool such as list reduction or multivoting. Use the priorities matrix to compare opinions. When possible, however, it may be better to utilize previous summarized data the various criteria. Form Sub-teams to collect data on the various criteria. Several criteria for selecting a problem or improvement opportunity require guess-estimates about the ultimate solution. For example: evaluating resources required, payback, difficulty to solve, and time required to solve. Therefore, your rating of the options will be only as good as your assumptions about the solutions. When evaluating options by method 1, some people prefer to think about just one option, rating each criterion in turn across the whole matrix, and then doing the next option and so on. Others prefer to think about one criterion, working down the priorities matrix for all options, then going on to the next criterion. Ask your team and then take their pick. If individuals on the team assign different ratings to the same criterion, discuss this so people can learn from each other’s views and arrive at a consensus. In some versions of this tool, the sum of the unweighted scores is also calculated and both totals are studied for guidance toward a decision. When using this tool choose a plan, solution, or new product, results can be used to improve options. An option that ranks highly overall but has low scores on criteria A and B can be modified with ideas from options that score well on A and B. This combining and improving can be done for every option, and then the priorities matrix used again to evaluate the new options.